4 years of blogging, cant believe this. Time flies and today is my blog baby's 4th birthday, seriously i started blogging just to spend my time and to share my passion for food. But never thought that i will stay 4years in this virtual world, to be honest this blogsphere is almost like my sweet home with a bunch of wonderful friends from all around the world. Thanks to few of my virtual friends who pulled me to start this wonderful space and thanks a ton to all my fellow bloggers and followers for all yours supports and encouraging words. For this month's Baking Eggless challenge, Gayathri choosed Lemon coconut bread from Dimah's Orange Blossom Water.Lemon and coconut in bakes who will say no to this combo and i prepared this bread last week for our evening snacks. 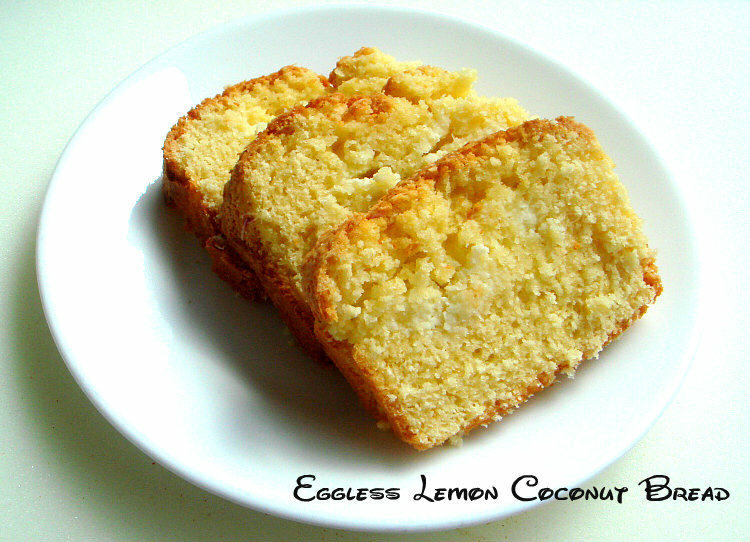 I used condensed milk as egg subsitute in my bread and went as the original recipe says, apart from it since we dont get sweet coconut flakes,i used dessicated coconut and didnt went for confectioner's sugar glaze. I have to say this, while this bread was baking in my oven, the aroma of this bread was awesome and filled the house completely. Everyone was waiting eagerly to get a slice of this bread. Its vanished quickly, thats y i couldnt able to take the picture of the whole bread. These three slices were left for me and i clicked it immediately coz my lil one started asking again. Thanks to Gayathri for choosing one more fabulous bake and we simply love it. Heat oven to 350°F.Line a baking sheet over a baking loaf pan and keep aside. Add yoghurt,lemon juice and lemon zest and beat until they get well mixed. Stir in the sieved flour mixture and salt until well mixed. Combine cream cheese and sugar in a small bowl for filling and mix well. Stir in the dessicated coconut. Spoon half of batter into prepared pan. Drop the filling mixture evenly over batter. Pour remaining batter over filling,bake for 40-45 minutes or until top is deep golden brown. Keep aisde and let the bread gets completely cool. Slice it as you desire and enjoy with a cup of coffee or tea. 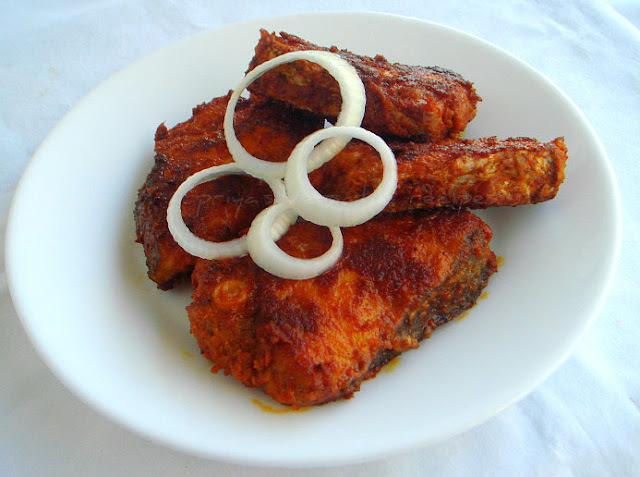 We usually have seafoods twice a week, most of our dishes goes for fish fry coz everyone at home just love it. After fish, we love prawns, i never forget to buy them whenever i go to Indian groceries,coz the prawns we get in chinese stores doesnt taste great as we get from Indian groceries. Earlier when i came to Paris, i was awestuck to see the varieties of frozen prawns we get here, but somehow nothing will be like the fresh prawns we get in Pondicherry. Wat to do, we have to manage everything and my tastebuds started accepting those frozen prawns. 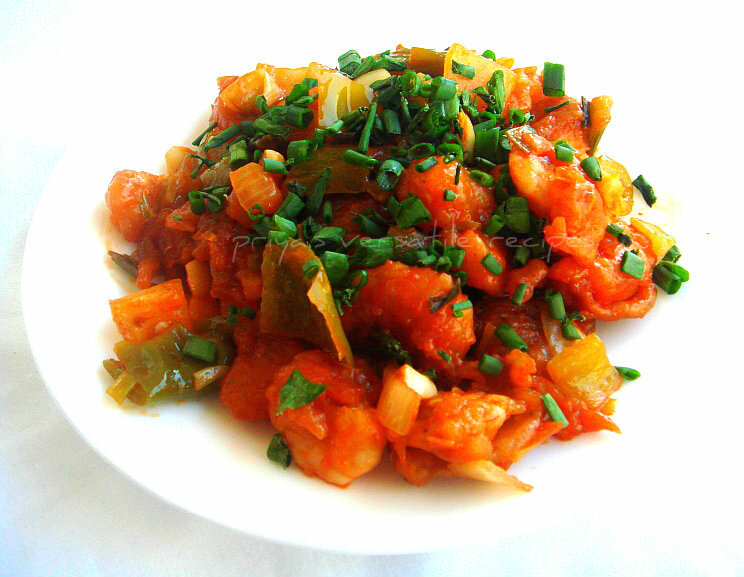 Coming to this sweet and sour prawns, i prepared this delicious prawns for our last sunday's lunch. I simply served it with a bowl of ghee rice, both together tastes fabulous. You can serve this prawns very well with a bowl of hot steaming rice.Everytime we go to Chinese restaurant, we never failed to order this sweet and sour prawns, its been a while i wanted to try them at home. Finally i prepared them at home in my own way to suit my tastebuds.Sending this irresistible prawns to Usha's Seafood Feast. Marinate the prawns with light soya sauce,chilly paste, sugar,ketchup and vinegar for half an hour. Heat the sesame oil in a kadai, add the minced garlic and ginger, saute for few seconds, now add the diced onions and toss for few seconds. Add the marinated prawns with the marinated paste,salt and cook in high flame for few seconds, add the diced bellpeppers and cook everything for few more minutes until the bellpepper gets paritally cooked,put off the stove. 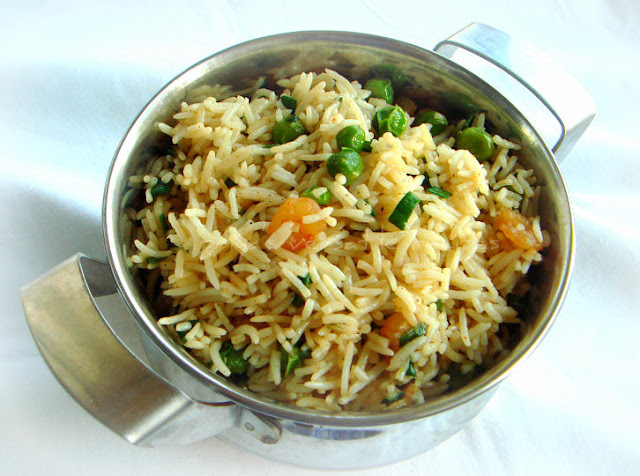 Serve hot with a bowl of rice garnished with spring onions. My fruit basket will always have bananas and apples, its a peak season of grapes here and we couldnt stop ourselves having them quite often. Some tastes super delicious while some tastes somewat sour, as i dont want to trash them i simply finished them as this wonderful juice by combining together with red apples. This combo works out wonder and simply went for honey instead of sugar for making this juice. With loads of icecubes, this juice is definitely a fantastic thirsty quencher and suits prefectly for a hot summer days.Sending this healthy juice to my own event Healthy Diet-Healthy juice guest hosted by Kiran. Blend together the grapes and chopped red apples with chilled water as per need as smooth paste. Strain the juice, add enough honey and water,give a stir and serve with ice cubes. Every year i try to get fresh chilly powder and coriander powder from India,but sometimes i finish them easily and quickly if i make Indian foods very often. Few days back, while going through my pantry i noticed that i just have few teaspoons of red chilly powder and i dont want to finish them at all. I can get super hot chilly powder from Indian groceries here,somehow i dont like it, personally i felt that they are very bright in colour (dunno whether they add food colour) and very spicy for our tastebuds,finally i decided myself to make my fish fry masala at home with dry red chillies and few more spices. Nothing will beat this super flavourful homemade masala, i just marinated my fish slices for two hours and fried them. Oh boy, they tastes super delicious and the spices i used in them gives a wonderful flavourful to this frozen fish slices and turned them simply awesome. We enjoyed thoroughly this superb fish fry with hot sambhar rice.I conserved this masala paste in an air tightened box and kept in fridge for a week, they suits prefect even for masala fried chicken.This masala paste is really handy and definitely flavourful when compared to the store bought ones.Sending this irresistible fish fries to Usha's Seafood Feast. Dry roast the red chillies,coriander seeds, peppercorns,cumin seeds,fennel seeds,cloves and cinnamon stick until a nice aroma comes out. Keep aside. To the same pan,add few drops of oil, saute the chopped onions,curry leaves and garlic cloves, cook until they get partially cooked. Now take the roasted spices and onion-garlic together in a mixie jar, add the turmeric powder,lemon juice and grind as fine and thick paste with enough water. Conserve this paste in a cleaned air tightened box;keep it in fridge and finish them before a week. Take enough paste in a plate, add the rice flour,salt and mix it.. Apply this thick paste evenly over the fish slices and keep them aside for atleast two hours. Fry the fish slices with enough oil in medium flame and drain the excess oil with a paper towel. Serve hot with your favourite dish. If you searching for a healthy,fibre rich protein packed dinner, definitely this healthy dal crepes with foxtail millet will satisfy you. 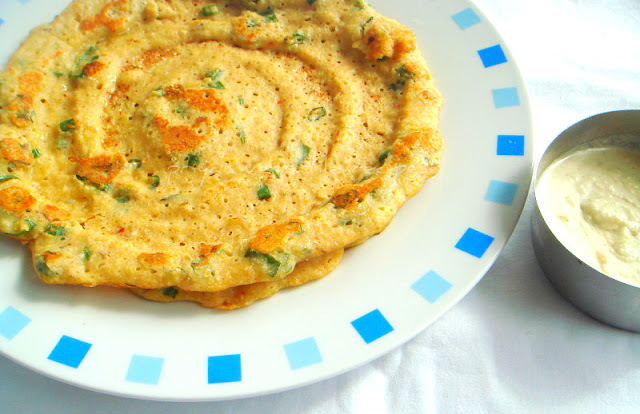 Wat all you need is to soak the dals and millet together for 4 hours and grind them as batter,make them as this fantastic crepes and enjoy with spicy coconut chutney, yeah its soo simple and easy na. No fermentation, no other complications,also this healthy crepes suits even more prefect for your breakfast too. We dont have Indian foods for our breakfast,so most of these healthy dishes are relished by us only during dinner. 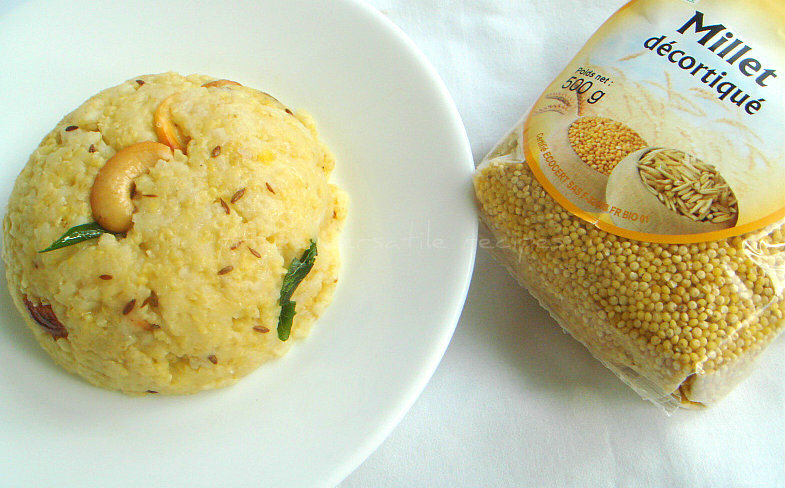 Give a try friends, also its a best and better way to sneak healthy foxtail millets. Sending this healthy dish to CWS- Rye or Millet guest hosted by Simona..
Soak the foxtail millet, brown rice along with all dals for atleast 4 hours. Grind the millet,dal mixture with dry red chillies, fennel seeds, grated ginger with enough water and salt as bit coarse paste. Finally add the spring onions and give a stir. Heat a nonstick pan,pour a ladle of this adai batter, drizzle the oil and cook on both sides until the adai get well cooked. Serve hot with spicy coconut chutney..
Who will say no to brioche with less butter, definitely not me. One of my french food blogger shared her light version of brioche picture in her FB page, immediately i got hooked to her picture and commented that i would love to have a slice of that fantastic bread, she was very kind enough to give the ingredient list to me. Yesterday i immediately baked a brioche and they got vanished once it came out hot from the oven, even i had two slices with nutella spread. 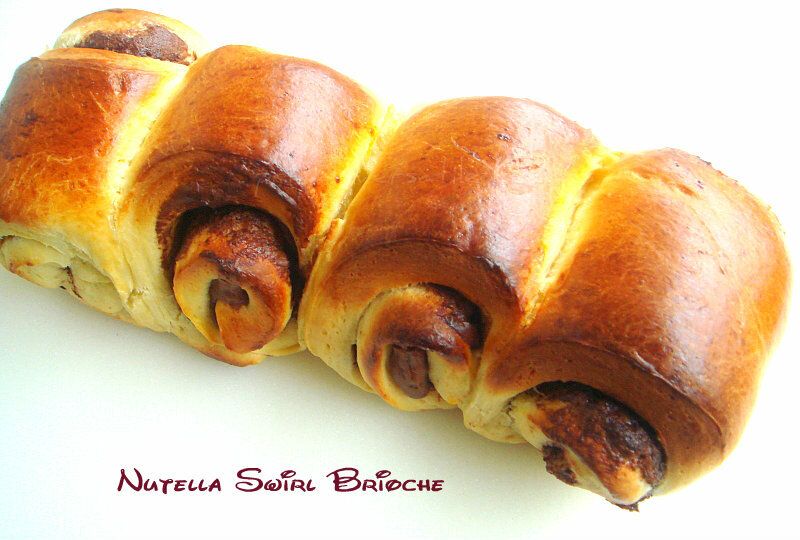 While having that simple light version brioche, my daughter asked me to make this brioche with nutella or either with chocolate chips. 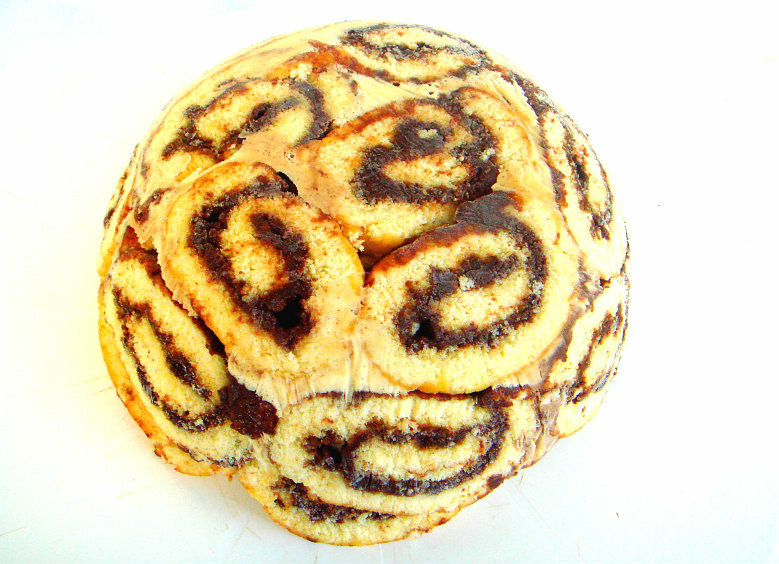 Thats how this nutella swirl brioche popped up in my mind.Oh this brioche was more addictive than the simple brioche we had yesterday,i prepared two loaves of this nutella swirl brioche today and my kids already finished a loaf of this attractive brioche and we will be having the another loaf for tomorrow's breakfast. Its really hard to keep my kids away from this brioche,yep its dangerously addictive. Check out the other marathoners running here.This delicious brioche goes directly to Dorian's Only Nutella. Knead the dough again for few minutes, divide the dough as two balls. Roll the balls are two rectangle dough, gently spread the nutella generously. Roll them tightly as a log, slice the logs are 4 big slices and arrange them in the greased baking sheet lined over two loaf moulds. Keep the moulds in warm place for half an hour. Preheat the oven to 350F. Mix the egg yolk with milk for brushing together, now brush the uncooked brioche generously and bake them for 25-30minutes until the crust turns golden brown. Cool it completely on a wire rack. Enjoy! While its chilled outside, dunno about you all but i'll definitely make some hot chocolate or either deep fried snacks. My love for hot chocolates never failed to pull me to make even if its too hot outside. 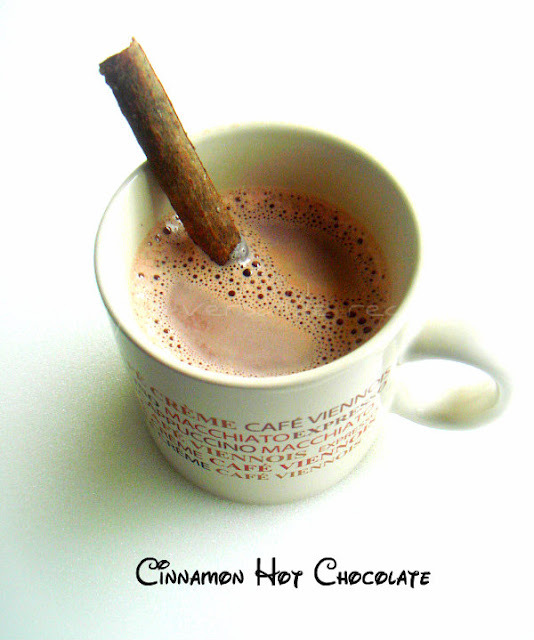 Last two days back,suddenly the weather was somewat dull and i didnt hesitate a second to make out some cinnamon spiced hot chocolate. If you love cinnamon flavours in your tea or in bakes, am damn sure this hot chocolate will definitely satisfy your tastebuds. An incredible drink to enjoy seriously when its chilled outside. Check out the other bloggers running this 19th edition of blogging marathon here.Sending to Kid's Delight-Chocolate guest hosted by Vaishali,event by Srivalli. Bring boil the milk,cinnamon stick and dark chocolate chips together until the chocolate chips gets well melted,whisk it with enough sugar. Discard now the cinnamon stick and serve it immediately. Here comes an another week of blogging marathon, for this week of 3 days blogging marathon i choosed the theme Kid's delight-Chocolate. Who will say no to chocolates, very rarely especially my kids can have anything with chocolates everyday at anytime of the day. So when i saw this theme for this 19th edition of blogging marathon, i know i'll go for this theme immediately. 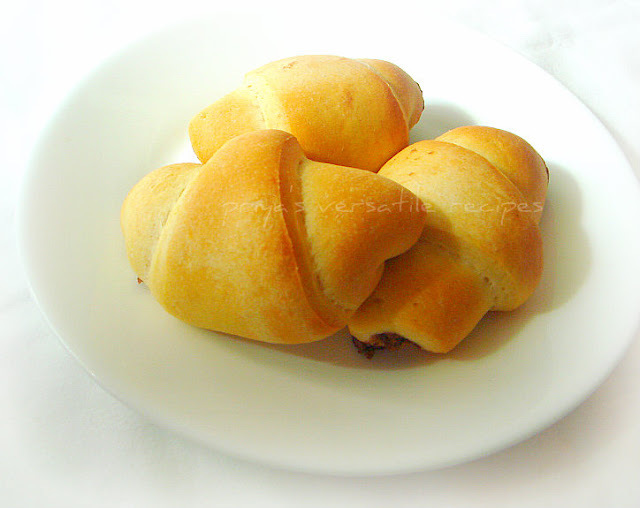 For the first day of this fourth week of blogging marathon,am here with an addictive, damn cute crescent rolls filled with nutella spread. 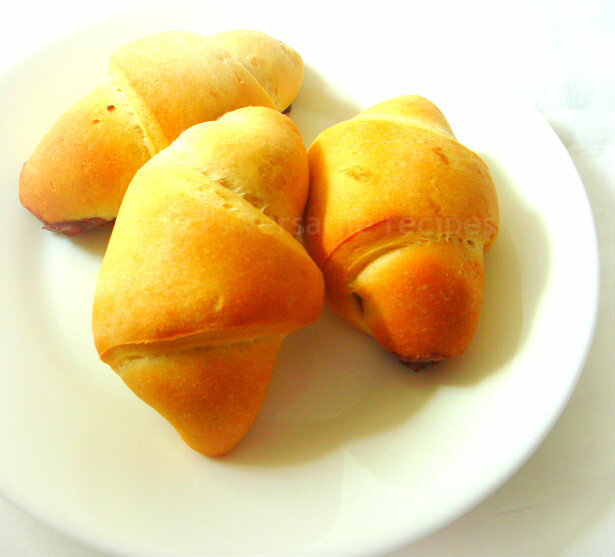 These cute rolls are super attractive, irresistible,an excellent rolls to enjoy with a cup of milk or hot tea for your snacks, its quite easy to prepare and definitely a kid's favourite rolls.I crossed these Jam rolls from Orange blossom water, i got hooked immediately to these rolls and i replace the jam with our favourite spread nutella.You can go very well for jam or peanut butter filled rolls somehow my favourite is definitely nutella filled crescent rolls. Check out the other marathoners running this fantastic blogging marathon here. Now add the softened butter, confectioner's sugar,bread flour,and the foamy yeast mixture,water (if needed) and knead as a soft and smooth dough, arrange this dough in a greased bowl and keep this bowl in a warm place for two hour with lid closed until the dough doubled their volume..
Knead well until the dough turn soft, divide them a two balls..Dust the balls with enough flour and roll as medium sized large circles. Preheat the oven to 350F.Cut the circles as quarters,then cut again as quarters to get 8-12 quarters. Drop a teaspoon of nutella spread over it and roll as cresecent. Brush generously and arrange them over a baking sheet lined over a baking sheet. Bake for 20-25minutes until the crust turns golden brown. Keep aside and let them cool completely. These rolls tastes marvellous and needless to say that they really very dangerous, you cant control yourself having them. A celebration do need an excellent cake else its wont be much fun, today my son is celebrating his birthday to change our routine vanilla cake frosted with chocolate ganache birthday cake i prepared this elegant icecream cake. Since the weather is too hot, its better to make something refreshing than usual cake na, while bloghopping i was amazed by the swiss roll icecream cake by Manju's Eating Delights's, she used strawberry jam and vanilla strawberry icecream for making her swiss roll icecream cake. Immediately i know that am going to make this cake for my lil one's birthday. The weather didnt helped me a lot, icecream while stuffing got melted quickly and started oozing out in between the swiss roll,but its doesnt matter coz i prepared this cake with loads of love specially to my lil darling. Manju's cake will definitely makes you drool. As my lil one asked vanilla and chocolate in his birthday cake, i replaced the strawberry jam with a quick chocolate sauce and finished the cake with vanilla and chocolate icecream. The way Manju explanation about the preparation and assembling the cake was tremendous and definitely helped me a lot, thanks a ton to Manju for her tips and tricks. We are yet to cut the cake but the final result after freezing the cake tempts us already to enjoy the cake. Preheat the oven to 400F, line a greased baking sheet over a baking tray. Sieve together the cake flour and baking powder and keep aside. Heat water in a vessel, meanwhile take the eggs, sugar,vanilla in a bowl, keep the bowl over the vessel,keep the flame in simmer(the bottom of the bowl shouldnt touch the hot water). Beat the egg sugar mixture until they turns pale and smooth. Now take off the bowl from the vessel and beat again for few more minutes until the egg-sugar mixture turns like a whipping cream. Now fold the dry ingredients slowly until they get well combined, dont overmix. Transfer this batter to the already greased baking sheet and bake for 9-10minutes or a skewer inserted comes out clean. Meanwhile take a clean towel and dust a tablespoon of confectioner's sugar over it, this is for rolling the cake. Once the cake gets baked, immediately take them out from the oven and invert the cake to the already prepared sugar dusted towel. Remover the baking sheet and dust it again with the remaining confectioner's sugar. Keep one end of the towel inside the cake and roll it tightly to make a loaf and keep it on wire rack to cool completely. Once its gets cool, spread the nutella or chocolate sauce prepared already as you desire and roll the swiss roll again wrapped in a plastic wrap.Keep it in fridge until the spread gets firm. Keep the both vanilla and chocolate ice cream in counter top for few minutes. Take a medium sized dome shaped bowl, line it with a plastic wrap, cut the already prepared swiss rolls as medium sized slices, arrange one by one inside the bowl,until the plastic wrap gets covered by the swiss roll. Now spread the vanilla icecream to half of the bowl and finish the remaining with chocolate icecream, close the chocolate icecream with the remaining swiss roll slices. Tightly close the bowl with the wrap and keep it in freezer atleast two or three hours before enjoying. A prefect and definitely a refreshing cake for celebration which suits prefectly for hot summer days..
As i told earlier, its too hot here. So am spending not more than half an hour in my kitchen, most of our lunch goes for quick dishes and am cooking rarely rice, finally yesterday i prepared a quick and delicious fried rice with frozen green peas and small prawns.Fried rice doesnt need an introduction and they have loads and loads of variations, one can cook a fried rice even simply with spring onions and eggs. Anyone who want to have simple,comforting and flavourful one pot meal with less efforts, this fried rice is for you all. 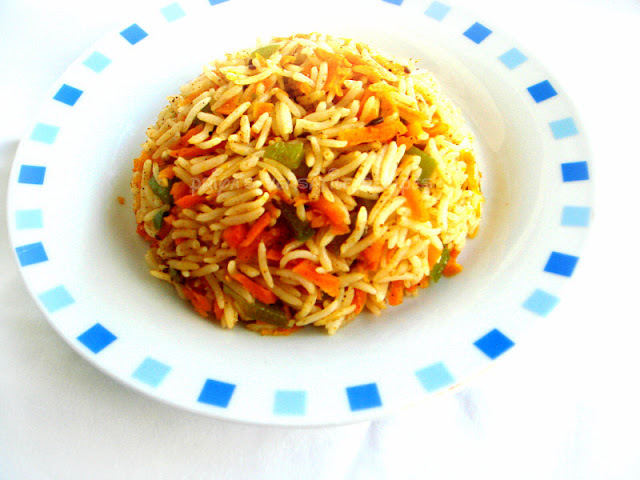 I simply used frozen green peas, if you want to make your fried rice more colourful, you can add many more veggies, am damn sure even kids will love this fantastic dish. Sending this irresistible fried rice to Usha's Seafood Feast. Heat enough oil in a wok, add immediately the minced garlic and grated ginger and fry for few minutes, add immediately the onions and cook them for few seconds. Now add the frozen peas,prawns and saute for few more minutes, now add the light soya sauce,white pepper powder,salt (if needed) to the cooking peas-prawns mixture.Cook for few minutes. Finally add the cooked rice and chopped spring onions and toss everything gently. Enjoy hot with your favourite side dish. Last week, hubby came back home with 2kgs of apricots from farmer's market, after having them simply as fruit salad and honey drizzled apricots, there were some leftovers. 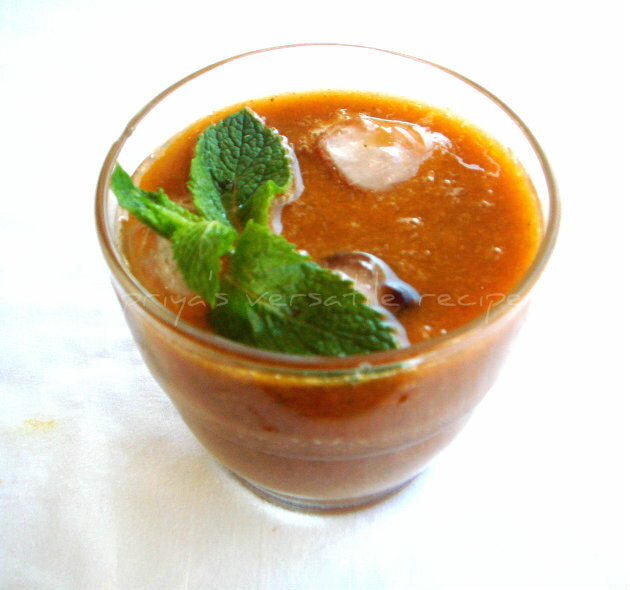 I quickly blended them with some fresh mint leaves as this thick and super refreshing juice. Mint gives a wonderful flavour to this easy breezy juice and with loads of ice cubes, you can enjoy this thick juice at anytime of the day while its hot outside.Sending this healthy juice to my own event Healthy Diet-Healthy juice guest hosted by Kiran. Take the chopped apricots,sugar or honey,mint leaves and chilled water in a blender, blend them for few minutes until they turns thick and smooth. Serve it with loads of ice cubes. Its super hot here, since three days its like living in Sahara desert.I cant able to spend more time in my kitchen and am making chilled foods and salads for the past three days. Its really hard to manage when your days are super hot suddenly. 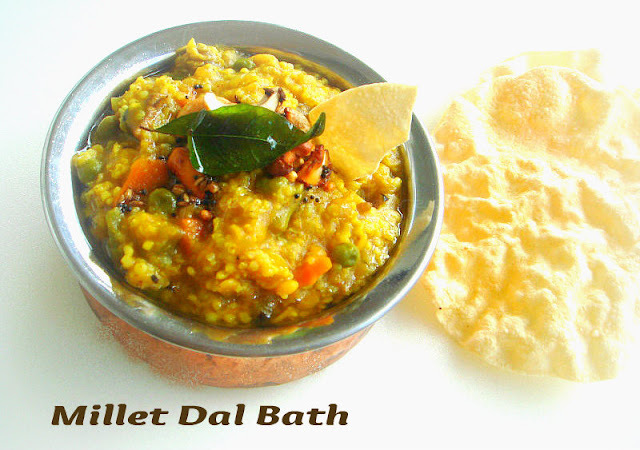 Hopefully we will able to get rid of this super hot sunny days soon.Coming to this millet pongal, i prepared last week for our dinner, this dish hardly needs less than half an hour to get ready coz the full cooking process goes for pressure cooking. If you want to have a nutritious,healthy and satisfying pongal, give a try to this healthy version, i completely skipped the rice here and prepared simply with foxtail millet and yellow split moongdal. You will definitely love this healthy pongal and am sure that using foxtail millet instead of rice is definitely a healthy twist to this most favourite South Indian breakfast. Sending this healthy dish to CWS- Rye or Millet guest hosted by Simona..
Wash together the millet and moongdal together and take in pressure cooker with three cups of water, ginger,asafoetida powder and salt, cook upto 3hisses. Kids wont ever say no to deep fried dishes especially the pooris,to be honest i wont make these puffy deep fried Indian breads often eventhough my kids like it very much. I know when i choosed PJ's space for this week's blogging marathon, i will go for an another theme of this 19th edition of blogging marathon 'cooking with greens' so obviously i went for searching dishes prepared with greens, the first recipe that i got hooked is these mini green pooris. 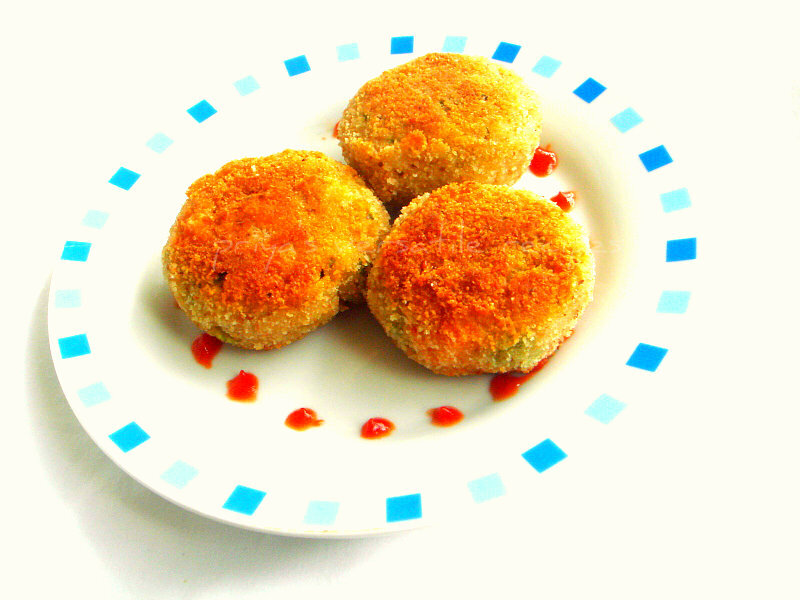 These cute mini green pooris are so attractive and definitely kid's will love it coz of its green colour, my kids doesnt even asked me a side dish to enjoy this deep fried beauties.Check out the other marathoners running this 19th edition of blogging marathon here. 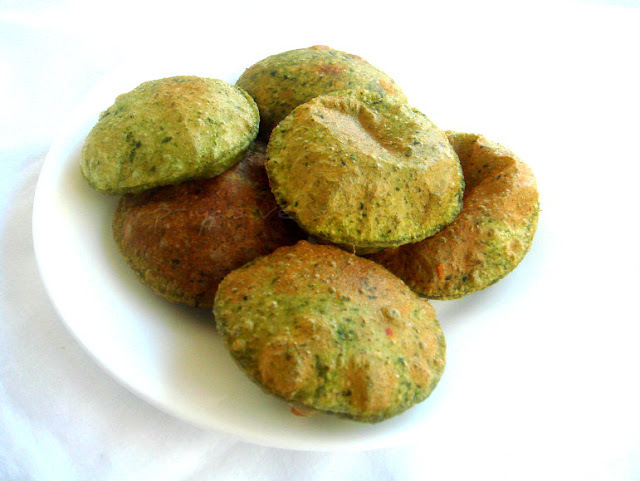 Take the wheat flour,ajwain seeds and salt in a large bowl, add the spinach puree and water (if needed), knead everything well as soft and stiff dough. Cover the dough and keep aside for half an hour. Roll this dough as two large thin circles, with a cookie cutter cut this poori dough as mini pooris and finish the whole dough. Heat oil for deep frying, fry those mini pooris in small batches and drain the excess of oil in a paper towel. Serve with spicy potato gravy or simply with sugar. If you have abundant of ripen bananas and you dont have any idea to finish them,you can prepare quickly and easily this wonderful looking brownies, these brownies will satisfy definitely your sweet tooth and suits prefect for a lazy evening snacks coz this brownies are prepared through microwave oven. As i told in my previous post, this brownies are from PJ's space, this brownies goes for a super quick preparation and both condensed milk,banana puree makes this brownies super moist and ultimately spongy and delicious. I used silicon mini moulds for making this brownies and also went for oil and chopped walnuts instead of butter and flax seeds PJ used in her brownies. My brownies turned out awesome within 2minutes and they vanished super quickly, my lil one enjoyed having this brownies topped with sugar pearls. Thanks to PJ for this super moist brownies, we enjoyed thoroughly when they were still warm and we just loved it.Check out the other marathoners running this blogging marathon here.Sending to Kid's Delight-Chocolate guest hosted by Vaishali,event by Srivalli. Sieve together the all purpose flour,baking powder, salt and dark chocolate powder. Whisk together the oil,sweetened condensed milk and banana puree in a bowl, now add the dry ingredients to the wet ingredients, mix with a spatula. Finally fold in the chopped nuts and pour enough batter to the silicon mould and cook in microwave oven for 2minutes in high temperature. Enjoy warm drizzled with chocolate sauce or simply with a cup of coffee. Time flies super fast, here comes already our third week of blogging marathon of this month, as i told earlier Srivalli is doing an amazing job in selecting the themes and am truly enjoying it. 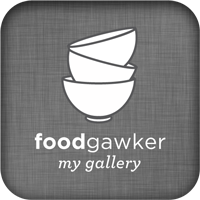 Coming to this 3rd week, i choosed the theme 'cooking from BM bloggers', this theme means a lot for me. Coz i really want to try many dishes from the other buddies running blogging marathon with me. 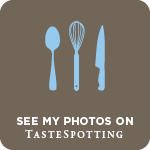 For this week i choosed to cook three wonderful dishes from PJ's Seduce Your Tastebuds, i love her blog very much and i never failed to visit her space. Seriously love her cooking style, she always come up with healthy dishes. For the first day, i choosed to cook under the theme 30minutes meal from Pj's space and went on searching in her space. The first dish i got hooked is this peppered carrot & capsicum rice, this dish goes for a super quick and easy breezy preparation and suits prefectly as a lunch box menu.Simply loved the simplicity of this healthy as well as flavourful one pot meal. Thanks to PJ for sharing this yummy rice, do check out the other bloggers running this 19th edition of blogging marathon here. Heat the oil in a heavy bottomed pan, fry the cumin seeds,curry leaves, onions with ginger garlic paste and cook until the onions turns transculent. Add now the grated carrot,chopped capsicum and cook for few more minutes. Add 2cups of water to the veggies and bring it to boil. Add the soaked rice without water with salt and pepper powder, cook everything in medium flame with lid closed until the rice gets well cooked. Its been a while i have prepared my snacks as deep fried, when i saw these biscuits at Jag's space i couldnt stop myself making these beauties with a combination of cornmeal and whole wheat flour.These biscuits are highly addictive,delicious and super crispy. These shakkarparas are very quick to make and definitely one of the easy breezy Indian snacks we have.Eventhough these biscuits are deep fried, they are somewat healthy coz of the addition of wholewheat flour,cornmeal and the roasted grounded sesame seeds in it. 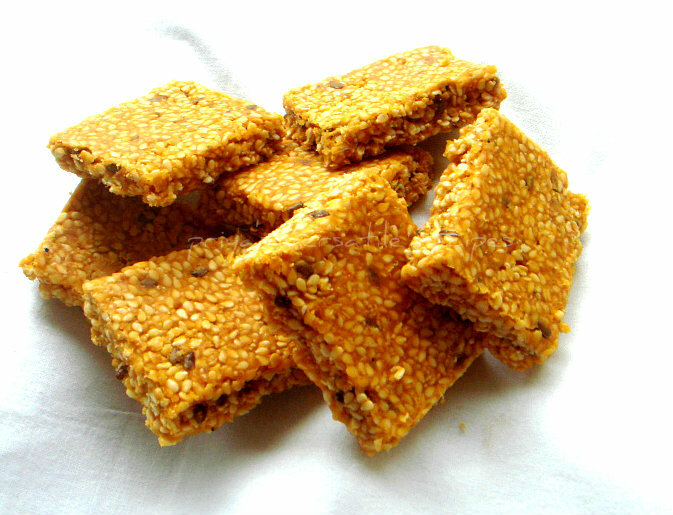 I prepared a medium box of these addictive jaggery biscuits, needless to say that they vanished within few minutes. 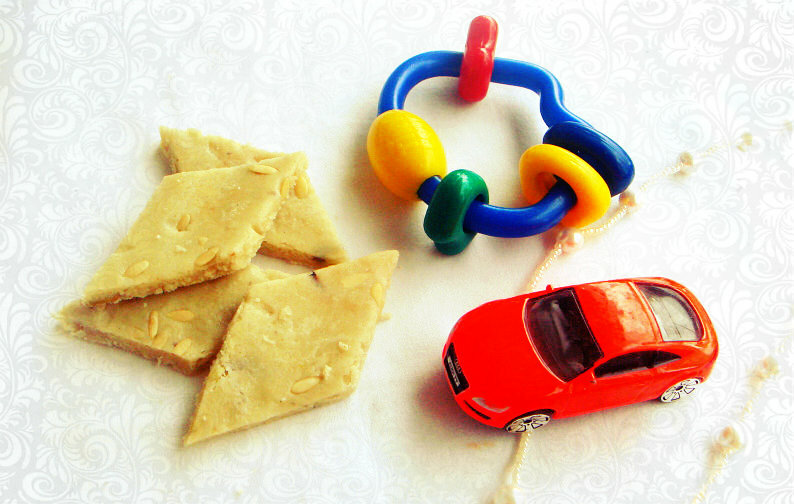 If you make them at home, am damn sure that you wont stop munching them urselves,yep they are dangerously addictive.These biscuits goes to Kalyani's Magic Mingle#8. Make a thick syrup with grated jaggery and water by heating them together, strain this syrup and keep aside. 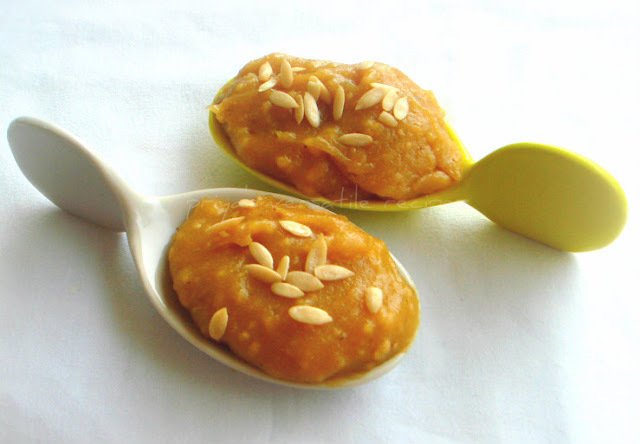 Now take the whole wheat flour,yellow cornmeal,grounded sesame seeds,cardamom powder, baking soda together in a bowl, add gradually the jaggery syrup and turn them as stiff and soft dough. Dust the dough with enough flour and roll as medium thick circles. Cut this rolled dough as diamond shaped medium sized pieces with a knife.Repeat until the dough gets finished. Meanwhile heat the oil for deep frying. Once the oil gets hot,put the flame in simmer, drop gently the diamond shaped biscuits and fry them until they gets brown. Enjoy it with your favourite drink for your evening snacks. Sorry guys am bit busy with household stuffs and i couldnt able to bloghop quite often as before, once i get finished of them,sure i'll promise you all that i'll definitely visit your spaces. Thanks a lot to my buddies for their continous support and encouraging words. Coming to this brittles, i quickly prepared them for our weekend trip for munching while driving as we travelled for almost 700kms this weekend, these healthy brittles with loads of sesame seeds and flax seeds satisfy prefectly our sweet tooth.Needless to say how healthy both sesame and flax seeds,so we dont have any reason to keep us away from these healthy brittles. We enjoyed having them, these brittles stay prefectly more than a week in room temperature.These brittles goes directly to Kalyani's Magic Mingle#8..
Dry roast the sesame seeds, flax seeds together until a nice aroma comes out. Meanwhile heat the jaggery with half a cup of water. Strain this jaggery syrup and bring it boil, cook in medium flame for few minutes,if you drop few drops of this jaggery syrup in a cold water, you should able to roll it as ball, at this stage add the roasted seeds and cardamom powder to the jaggery syrup. Cook until this mixture for few more seconds until the mixture turns thick, pour immediately to the greased plate,mark the pieces when its still warm and let them cool completely. Store it in air tightened box and enjoy. Our this month's Indian Cooking Challenge is this most famous Tamilian ulunthu kali.Most of the young gals from Tamilnadu would have tasted this healthy,nutritious kali once they attain their puberty,this healthy dish is quite a must. I still remember my grandma came from her village with a box of this kali with loads of gingelly oil and fresh eggs to feed me on that particular day.This kali is also very good for women to get rid of their back pain. Seriously i didnt prepared or heard about this kali after that, when i checked the Srivalli's mail with this month's challenge, i was quite happy to try out a traditional recipe after a long. I prepared this halwa last week and carried with us when we went for a weekend trip,an excellent dish to enjoy anytime of the day either warm or chilled. I have already seen this kali prepared at home, so i wasnt that much hard for me to cook them up. Dry roast the rice and urad daal separately until they turn slightly brown. Grind them as a coarse powder. Heat the water to boil,add the jaggery and cook until it melts. Now strain the jaggery syrup and bring it to boil. Slowly start adding the flours and cardamom powder, stir continously,take cake not to form lumps. Add oil slowly and stir continously. Cook on slow fire for a few minutes until they turns as a thick paste. Few days back i got a mail from Swathi asking whether am interested to join a new baking group called Baking Partners, baking the word itself makes me happy and i didnt even hesitated a second and send a reply mail saying that am very much interested. As i told earlier baking makes me happy and its a kind of therapy for me to keep away myself from my stress, obviously this baking group goes for many more food bloggers who joined with more motivation to share their ideas and their baking skills with others,this is wat i need too. Coz eventhough i bake quite often, am still want to know more about baking and frosting and all. This Reine de saba avec glacage au chocolat was choosed by Swathi for our first post as a tribute to Julia child, a famous celebrity cook on her 100th birthday. This cake came out excellent with a fabulous coffee and chocolate icing, my daughter helped me a lot while making this cake. She had loads of fun while doing the frosting and she decorated the cake by herself simply with sugar pearls and few almond slices. Preheat the oven to 350f. Butter and flour an 8 inch cake pan. Set aside. Melt the chocolate with the 2 tablespoons of coffee in a double boiler. Let cool. In a large bowl, cream the butter and sugar until light and fluffy. Beat in the egg yolks until well blended. Bthe egg whites and salt in a separate bowl until soft peaks are formed, sprinkle on the 1 tablespoon sugar and beat until stiff peaks are formed. With a rubber spatula, fold the melted chocolate into the butter and sugar mixture, then stir in the almonds and almond extract. Fold in one-quarter of the egg whites. When partially blended, sift on one-quarter of the flour, and continue folding, alternating with more egg whites and more flour until all is used. Turn the mixture into the cake tin, pushing the mixture up to its rim with a rubber spatula. Bake in the middle of pre heated oven for about 20-25 minutes. Cake is done when it has puffed, and 2.5 to 3 inches around the circumference are set so that a needle plunged into tha area comes out clean, the centre should move slightly if the tin is shaken,and a needle comes out oily. 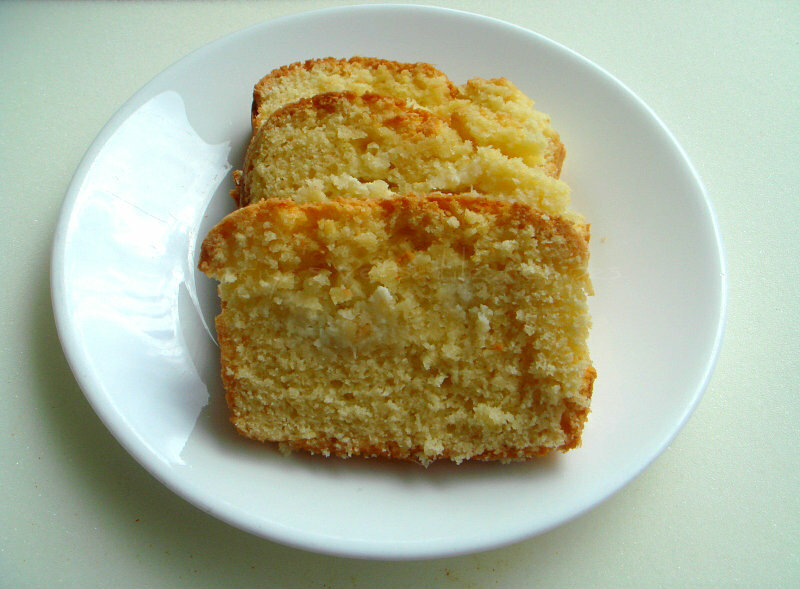 Allow cake to cool in the tin for 10 minutes. Run a knife around the edge of the tin, and reverse cake on the rack. Allow it to cool for an hour or two, it must be thoroughly cold to start the icing. Stir the chocolate and coffee in the saucepan over hot water until chocolate has melted into a very smooth cream. Remove the saucepan from hot water, and beat the butter into the chocolate, a tablespoon at a time. Then beat over cold water until the chocolate mixture is cool and suits prefect to spread. At once spread it over your cake with the spatula or knife. 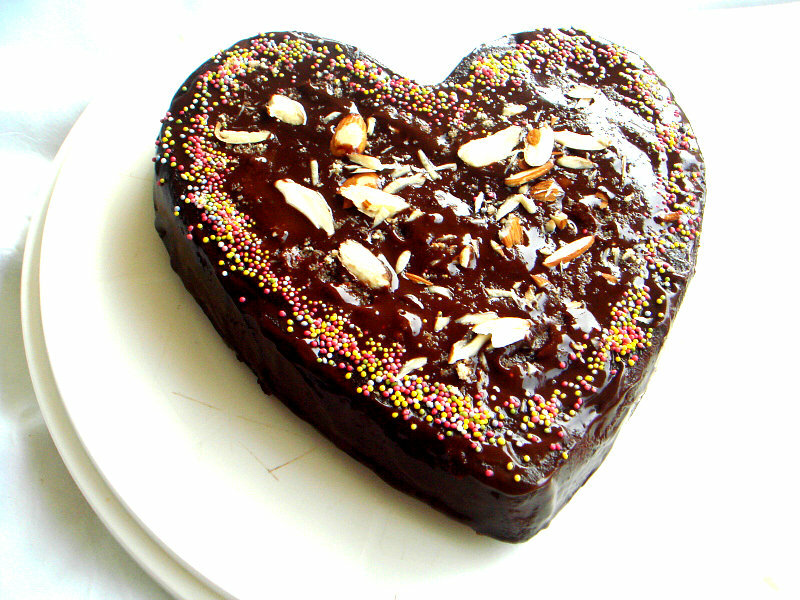 My cake is done after 20 minutes, i used a heart shaped 8inch cake mould. Use good quality of chocolate for making this cake. I used cornflour and all purpose flour instead of cake flour,this works wonder. Cake tastes absolutely awesome if they are served chilled. If you are coffee and chocolate lover, this cake will definitely makes you happy. I used toasted almonds for grounded almond meal. The original recipe goes for both rum and coffee, but i used strong brewed coffee in this cake.If you want to go for rum you can do it very well. Dont forget to try this cake, its quite easy and tastes absolutely divine. Healthy foods have their own place in our daily menu, i never failed to cook up our dishes with a new grain or flours. I usually go twice a month to the nearby organic shop to get some healthy flours like seigle,rye,quinoa etc, i'll add them quite often in our dishes to feed my family with it either by cooking them as savouries or sweets. This time i simply prepared this multigrain sweet dumplings with a combination of healthy flours like whole wheat, rye,barley,brown rice and oats along with jaggery syrup and sesame seeds. You can have this healthy dumplings with a cup of masala tea for your snacks also these dumplings gets ready very easily. I prepared this multigrain flour myself, just by combining a variety of flours. In case if you dont want to make urself your multigrain flour at home, you can go very well for storebought multigrain flour. 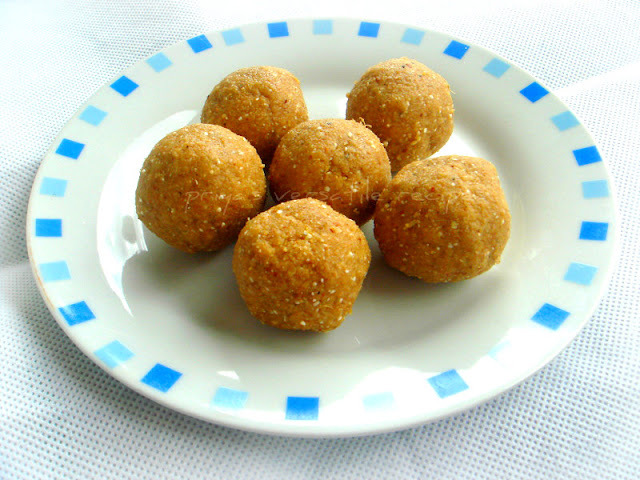 An excellent healthy cute paniyarams to enjoy without any hesitation, everyone at home just enjoyed it when they were still warm. Sending to Kalyani's Magic Mingle and to my own event CWS-Rye or Millet guest hosted by Simona. Take the flours,oats,baking soda, jaggery syrup,sesame seeds, cardamom powder in a bowl, mix everything well, add enough water to turn everything as a thick batter. Heat the paniyaram pan,pour few drops of oil, once the oil gets hot, pour enough batter and cook on both sides in medium flame until they gets well cooked. Its hot here, when its too hot the first thing that comes immediately to our mind is to enjoy chilled fresh fruit or vegetable juices. 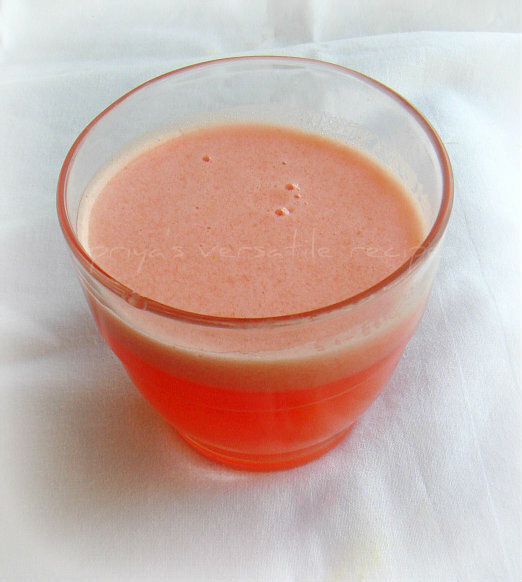 Here comes a quick,refreshing and simple healthy lemonade with fresh tomato and lemon juice, we usually make spiced tomato juice with pepper powder and salt. 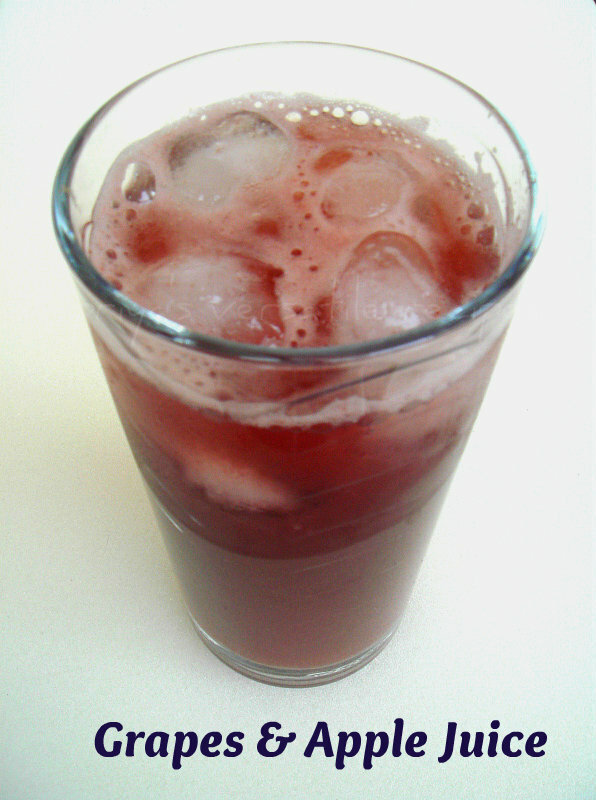 This juice is a sweet version with chilled water, sugar and lemon juice with red tomato chunks, thats y i named it as tomato lemonade. 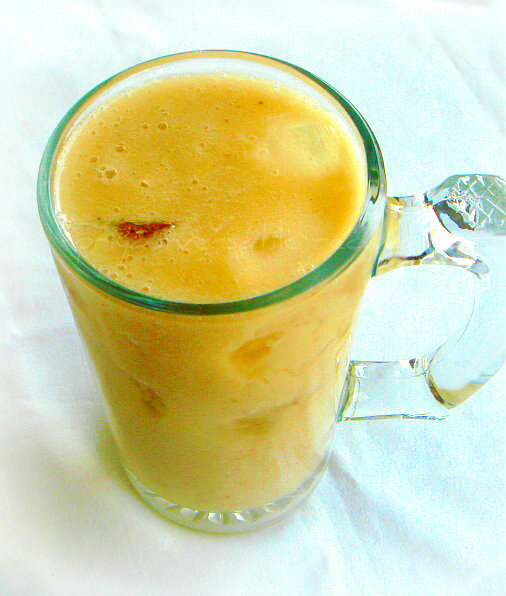 A prefect drink to enjoy without any guilt while its super hot outside. With loads of ice cubes, this lemonade will definitely satisfy you, a fabulous thirsty quencher too.Sending this healthy drink to my own event Healthy Diet-Healthy juices guest hosted by Kiran. Blend the tomatoes with sugar and water, strain this juice with a strainer and take in a large bowl. Add the chilled water,lemon juice and ice cubes as per need, stir it well. Serve immediately topped with lemon wedges if you desire. 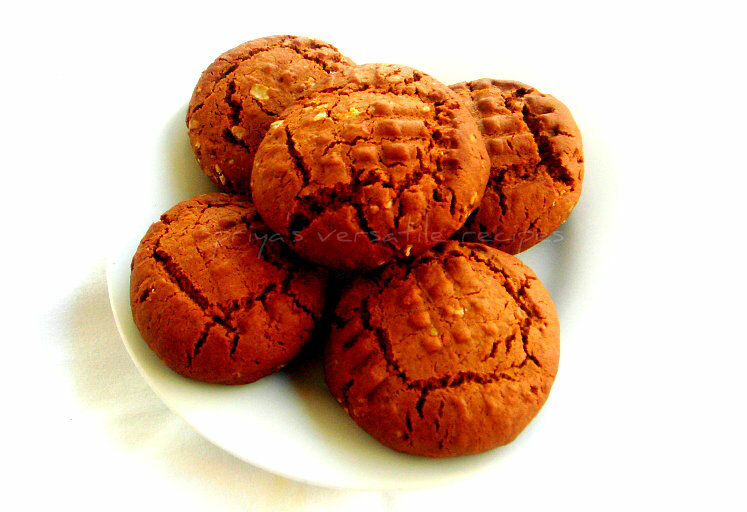 If you are searching a simple,quick,satisfying and super flavourful healthy snacks, these cookies are for you. With a mild coffee and cinnamon flavour these cookies are the prefect wonderful pair to enjoy with a hot cup of tea and they will definitely satisfy your sweet tooth. As i told earlier, rolled oats are my all time favourite grains and its been a while i didnt baked anything with my favourite grain. For this third day of blogging marathon, i dont want to make a shake or cake with coffee flavour and went for making this easy breezy oatmeal cookies. They turned absolutely awesome and needless to say these cookies are super addictive. Check out the other marathoners running this 19th blogging marathon here. Preheat the oven to 350F, mix together the flour,oats,baking powder,dark chocolate powder,,baking soda and cinnamon powder and keep aside. Beat the butter,sugar together until they turn soft and fluffy, now add the egg and coffee powder, beat again for few minutes. Now add the flour mixture,mix everything well as a dough. Drop a tablespoonful of the dough in a greased baking sheet, press the dough with a fork. Bake for 15-20minutes until the crust turns lightly brown. Cool them completely. Serve with your favourite drinks. I have already told its summer here,but when its comes to temperature its not at all summer here. Before a week, its was super hot and suddenly its raining like anything. Peoples whoever went for summer vacations to the Northern part of France came back home without any satisfaction as they spend their vacation with very bad climate. Obviously this summer wasnt that much hot here, anyhow i couldnt stop myself making icecreams and chilled desserts for us. For the second day of the blogging marathon, i wanted to make something chilled. First i planned to make some sorbet with green tea or iced tea,but somehow i want to go for my all time favourite kulfi. 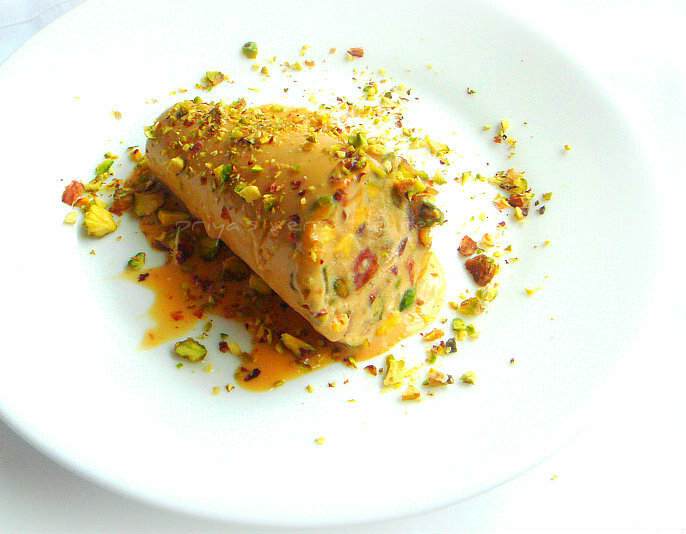 This kulfi goes for quick preparation with spiced tea water, sweetened condensed milk, chopped pistachio nuts and heavy cream.Oh boy, you guys have to give a try to this masala chai kulfi, seriously this kulfi tastes absolutely divine. Check out the other bloggers running blogging marathon here. Bring boil the milk with tea powder,crushed cardamom,cinnamon stick and cloves, strain it in a large bowl and keep aside. Cover it with a lid and gets completely cool. Add the condensed milk and chopped pistachios to the tea flavoured milk and keep aside, meanwhile beat the heavy cream until it forms soft peaks. Gently add the already prepared mixture to the cream and whisk slowly until everything gets well mixed. Divide this mixture in kulfi moulds or plastic cups as per need and let them sit in freezer for overnite. While serving,run the hot water over mould, pull it with a knife to the plate. Serve with some chopped nuts. Am a coffee lover, i cant start my day without a hot cup of coffee. For this second week of blogging marathon when Srivalli announced the theme, i choosed immediately this interesting theme recipes with chai or coffee. For this first day of my second week of blogging marathon, i prepared quickly this ultimate and super moist mocha pistachio muffins. 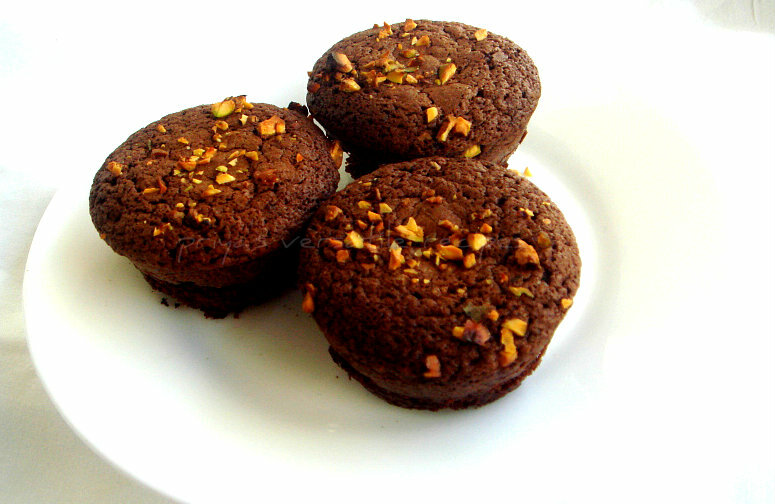 With loads of dark chocolate,pistachios and instant coffee powder, this muffins are definitely addictive and irresistible. 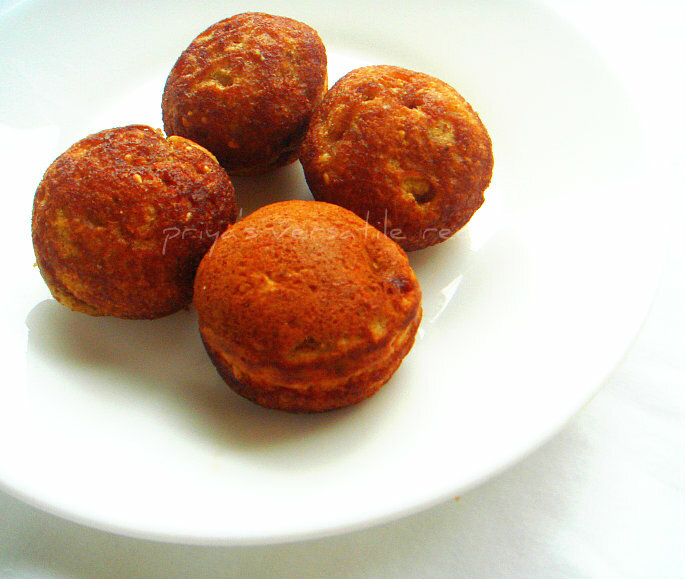 A prefect super moist muffins to enjoy without any hesitation with a cup of warm milk either for snacks or for breakfast if you like bakes with coffee along with a cup of hot coffee. Do check out the other marathoners running this 19th edition of blogging marathon here. Beat the eggs and sugar together until this mixture turns pale and smooth.Add the coffee powder and beat again. Meanwhile, sieve together the flour with baking soda,baking powder and keep aside. Now melt the chopped chocolate with 1/3cup water in microwave oven and make a smooth chocolate sauce. Add this chocolate sauce,oil and yogurt to the egg-sugar mixture and beat everything for a while. Preheat the oven to 350F, gradually add the dry ingredients to the wet ingredients with a spatula until the batter turns smooth.Gently fold the chopped pistachios to the batter. Divide this batter to the already greased muffin pan,springle few chopped pistachios over the batter and bake for 20-25minutes until a skewer inserted comes out clean. Today most of us will be celebrating Lord Krishna's Janmashtami (birthday) with many savouries and sweets. We Are ready for a weekend trip and i was completely hooked with the bagages and all, instead of making many savouries and sweets, i quickly prepared this healthy and super delicious kheer for the pooja. 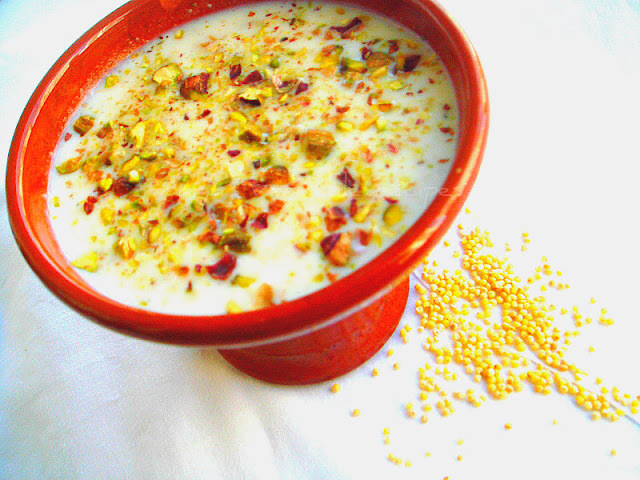 This kheer will hardly take less than 30 minutes and the complete cooking process will go for pressure cooking. I used as usual condensed milk for making this kheer more delicious and we couldnt stop ourselves having this irresistible healthy millet kheer. Sending this kheer to my own events CWS-Rye or Millet guest hosted by Simona and Healthy Diet- Cooking with Whole Grains guest hosted by Jaya. Pressure cook millet with milk upto 2 whistles..once the steam get released, pour the sweetened condensed milk, water (as u desire), bring boil everything. Meanwhile heat the ghee and fry the cashew nuts until they turns golden brown..add to the kheer, put off the stove and finally add the cardamom powder. I was paired with Kalyani of Sizzling Tastebuds for this month's of bloghop wednesdays, a monthly event started by Radhika. I always impressed the way Kalyani cooks and am an ardent fan of her space.I have already bookmarked so many dishes at Kalyani's space and seriously i was soo happy when i was paired with her, my first choice was to make her steamed dal vada, but somehow i went for my recent bookmarked recipe 'couscous peas tikki' from her place. 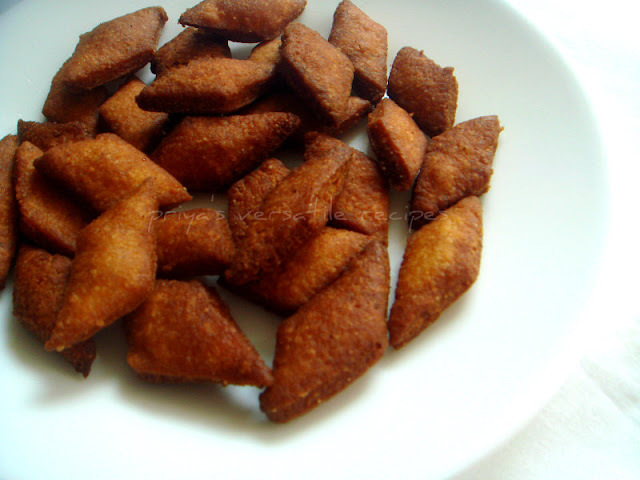 These tikkis are simply awesome, gets ready very much quickly. An excellent snack to enjoy simply with ketchup,spicy chutney or with spiced curd.As Kalyani told these tikkis suits prefect even for potlucks or a simple birthday parties. Take the cooked couscous,cooked peas and cooked potatoes in a large bowl, add the garam masala powder, chaat masala,chopped green chillies and fennel seed powder with enough salt. Using the fingers, smash well everything and make a thick paste. Make a medium sized balls from this mixture,flatten them as tikkis and keep aside. Mix the maida with enough water to make a white sauce,gently dip the tikkis one by one to the white sauce and roll it over the bread crumbs until the tikkis gets well coated. Arrange in fridge for half an hour before shallow frying. Heat enough oil for shallow frying, fry the already prepared tikkis on both side until the crust turns golden brown. I know when i bought a huge packet of yellow custard powder from Indian store, i'll finish them as soon as bakes instead of making usual fruit custards. 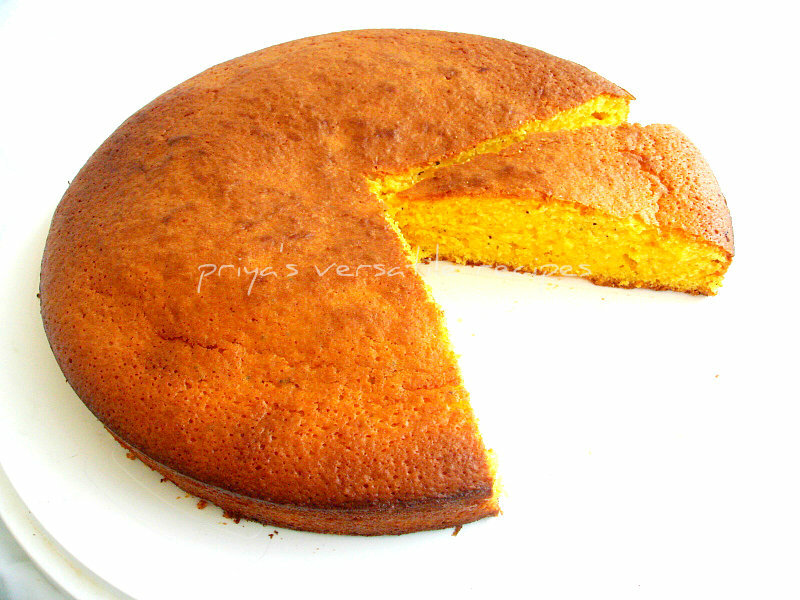 Here comes our recent family favourite yellow spongy cake with custard powder. 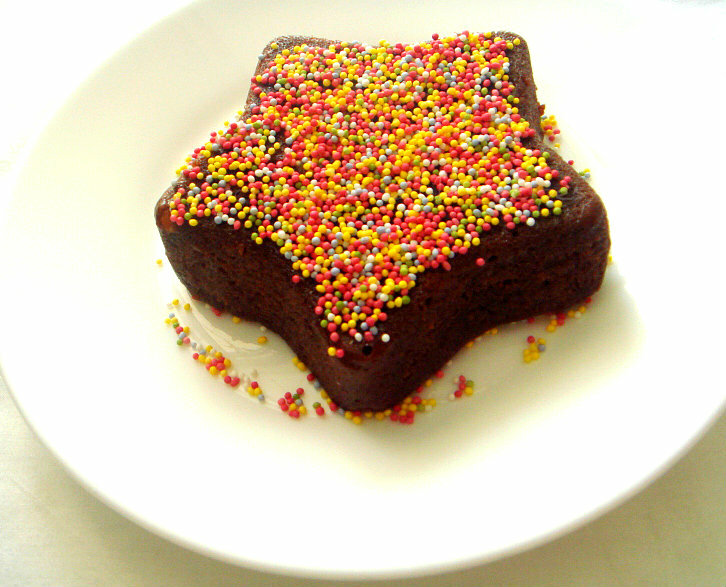 This cake gets ready super quick and also vanish very much quickly when served along with a hot cup of coffee or tea. I used eggs in this cake if you want to skip it you can do them very well.I also combined both wheat flour and all purpose flour for making this cake,you can go entirely for the all purpose flour too if you dont want to go for whole wheat flour and obviously the custard powder used here gives a wonderful yellow colour to this extremely super delicious spongy cake.Sending this gorgeous sponge cake to my own event Healthy Diet-Cooking With Wholegrains guest hosted by Jaya. Sieve the flours, baking powder,baking soda and custard powder together and keep aside in a bowl. Beat the eggs with sugar until they turns pale, now add the oil and yogurt to this egg-sugar mixture and beat for a while. Now mix the vanilla extract,already sieved flours gradually to the wet ingredients with a spatula, dont over mix the cake batter. Preheat the oven to 325F, grease generously a round cake mould and keep aside. Pour this cake batter to the already prepared round cake mould and bake for 25-30minutes in the middle rack until a skewer inserted comes out clean. I completely stopped buying paneer from Indian stores and am making fresh homemade paneer quite often, whenever i feel like making dishes with paneer. After using fresh paneer cubes for making curries, there were some leftover crumbled paneer.I used those leftover paneer for making this wonderful looking wholewheat buns. 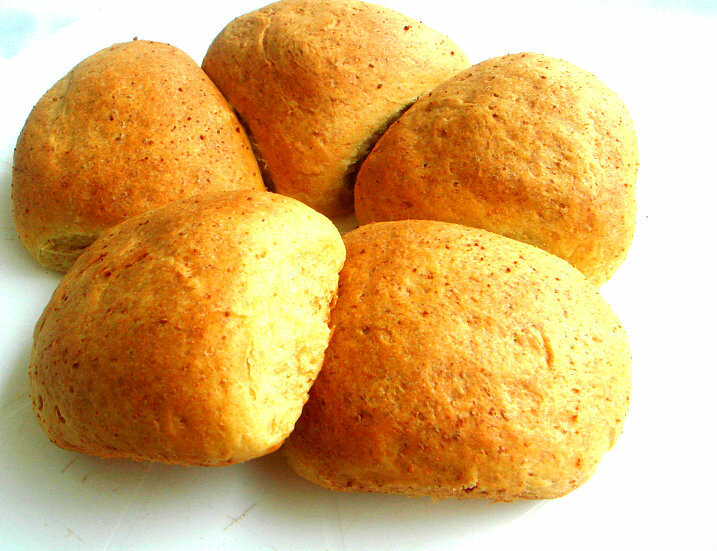 These buns turned out extremely super spongy, prefect to enjoy with any sort of spreads for anytime of the day and also goes incredibly awesome to serve along with warm comforting soup. Obviously this paneer buns suits prefect for my theme of this week's blogging marathon as paneer is an excellent source of calcium. If you are bored of usual paneer bhurji with crumbled paneer, just give a try to this fantastic buns. Check out the other bloggers running this week of blogging marathon with me here.Sending to my own event Healthy Diet-Cooking With Wholegrains guest hosted by Jaya. Take the whole wheat pastry flour,crumbled paneer and mix everything well,slowly add the foamy yeast,water if needed and olive oil and knead as a soft dough. Place the dough in a greased bowl, cover the bowl with a towel and arrange in a warm place..let them sit for an hour until they double the volume. Preheat the oven to 350F,brush the breads with olive oil and bake in middle rack for 20-25 minutes until the crust turns brown. You can make this irresistible pudding within less than 10 minutes and this eggless pudding with strawberries goes for simple and quick preparation. I used agar agar powder instead of gelatin since i read somewhere that gelatin are made from animal bones and all. This yummy eggless pudding is simply prepared with a cup of strawberries and milk, condensed milk, fresh cream and agar agar powder. If you want to make a vegan version of this pudding, you can replace the usual milk with almond or coconut milk. 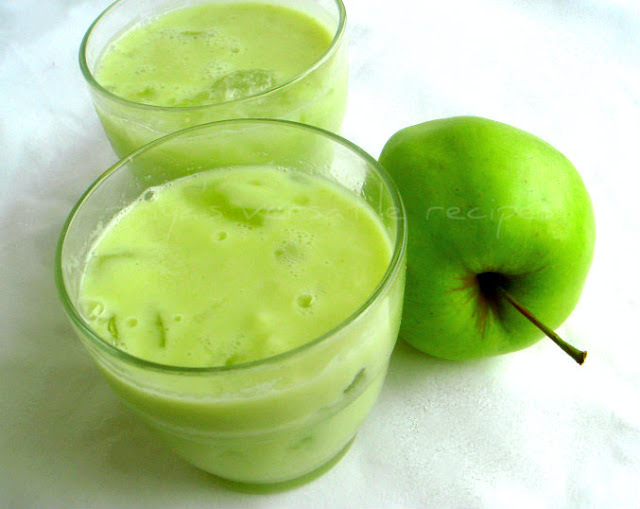 Quite a refreshing pudding to enjoy as dessert after heavy meal or for evening snack while its too hot outside. We just enjoyed relishing this fantabulous delicious pudding.Check out the other foodies running this 19th edition of blogging marathon here. Blend together the strawberry chunks, milk, fresh cream,sweetened condensed milk as a thick paste. Heat 2 tablespoons of water, add the agar agar powder and cook until the agar agar powder gets dissolves well.Keep aside for few minutes until this mixture truns cool. 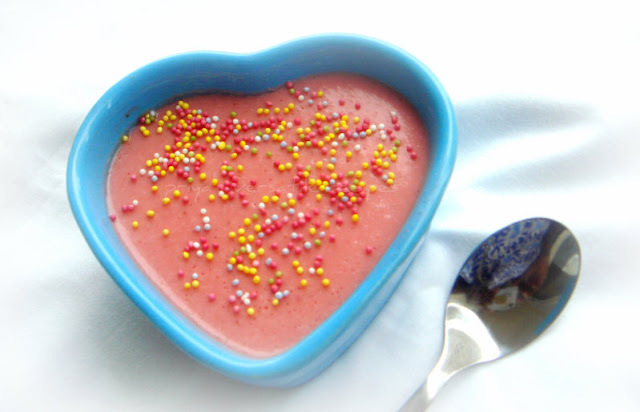 Stir immediately this agar agar mixture to the blended strawberry paste and divide this pudding mixture to a serving bowls and arrange in fridge for 2hours. Serve this pudding topped with sugar pearls and enjoy. A month without blogging marathon, i cant even imagine it. Even this month will be somewat hectic for me, i dont want to miss this month's blogging marathon. I know while this post is in my space, i'll be travelling towards Paris from Belgium. We are just enjoying this trip to Brussels and Bruges, with loads of Belgian chocolates,waffles and many more beautiful visit to Belgian monuments. Coming to this month's blogging marathon, i choosed again very interesting themes and for this first week of blogging marathon i choose calcium rich foods. Calcium is very much rich in milk products and in many veggies and fruits.Thats why i choosed to combine both green apple and yoghurt to prepare this wonderful green lassi and my teddies enjoyed thoroughly.Check out the other bloggers running this 19th edition of blogging marathon here. 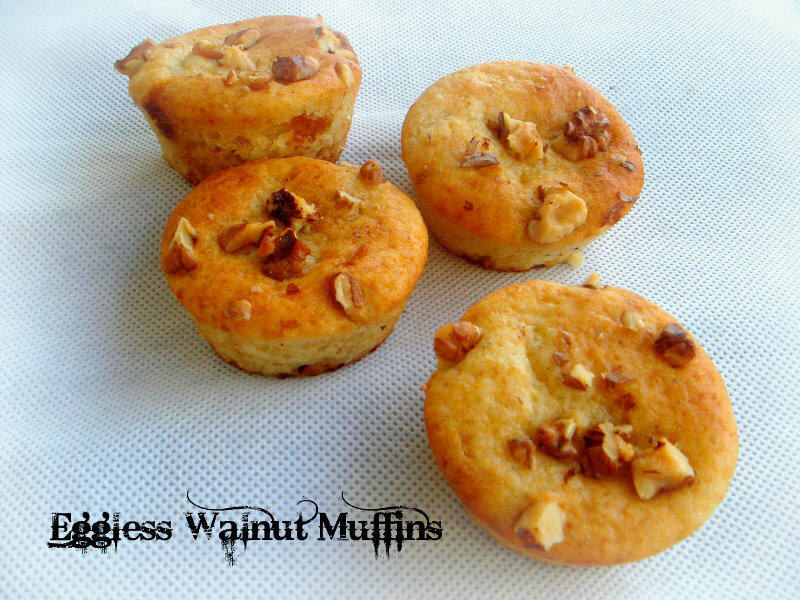 Love the concept behind guest posting, this walnut muffins are my second guest post am doing for my blogger friends. Archana of The Mad Scientist's Kitchen asked me to prepare a guest post specially for her few days back, i dont want to miss this opportunity at any cost, immediately i said ok and prepared an eggless muffins with my most favourite walnuts. Do check her space for my guest post, simply loved the way she wrote the introduction about me. Thanks Archana, thanks a lot for asking me to do this guest post. Enjoyed thoroughly too..
Preheat the oven to 350F..Sieve the flour with baking soda and baking powder,add the walnut powder,mix and keep aside. Beat the sugar,butter and oil until the sugar gets well dissolved, immediately add the buttermilk, and vanilla extract, whisk everything well..
Gradually add the dry ingredients to the wet ingredients, mix it well with a spatula,batter will be quite thick but dont overmix the batter,else ur muffins will turn hard. Drop enough batter to the silicon muffin tray and bake for 20-25minutes until a skewer inserted comes out clean.. If you would have said that blogging can make a wonderful friendship chain around the world before am entering to this virtual world, i would have laughed louder. But now i can realize that blogging can make a fantastic virtual friendship chain and am very happy that i have a fabulous virtual family through this blogsphere. Eventhough i met few of the foodie bloggers most of them are still virtual and personally i have never seen their face till today.No matter i have seen their face or not, blogging have no boundary and i love each and every blogger for their enthu,encouraging words,am very lucky to be one part of this marvellous virtual world. I have already participated in some virtual parties, here is again an virtual welcome party for Krithi of Krithi's Kitchen's baby boy Kavin. Her bundle of joy arrived on june, to celebrate this happy moment we some of the foodie bloggers decided to prepare a virtual welcome party for her baby.We choosed Indian sweets to prepare specially for celebrating this special moment. Loads of love to you Krithi, may god bless your lil prince. Krithi, hope you will truly enjoy this virtual welcome party we organised specially for you and your baby boy,take care of your health. Heat the water in a heavy bottomed pan, add the sugar and stir contionously until the sugar gets dissolves. Cook this sugar syrup until it reach hard ball consistency, take the pan from the heat,now add the almond powder,chopped pistachios cucumber seeds and mix well. Continue to mix until the mixture turns smooth and pliable. Transfer this mixture on a flat surface and spread in a baking sheet and cool it a bit. Cover the bit cooled katli with an another baking sheet and roll it thinly with a rolling pin. Cut into diamonds and serve. Can stay prefect for three days in room temperature.